When it comes to Women’s Clothing, even if you are a fabulous size zero to six, there are certain things this time of year you want to both emphasize and hide. Admit it, you would love for all of your gal pals and the special men in your life to see your incredible style! It might be a chilly forty degrees or less out there but that doesn’t mean you can’t look sensational! However, did you have a little too much fun during Christmas and the New Year? Even a single digit fashionista can show a bit of tummy bulge, what some call “winter fluff” when the temperature drops and we become a little less active. How does a fashion savvy gal let others see her at her best in the frosty months? Women’s clothing with layers; that and the stylishly unexpected. Scout and Molly’s of Deerfield Square has the personal stylists to make sure you’re looking and feeling your best throughout the cold months. Cold weather wear is all about small but perfect details. FifteenTwenty is doing wonderful work with stripes and studs! Little details like this can turn an ordinary pair of pants or leggings into a true fashion statement. The devil is in the details, ladies! Our personal stylists also suggest that you count in dramatic outerwear. How about a comfortable but oh so chic vest from Cupcakes and Cashmere? 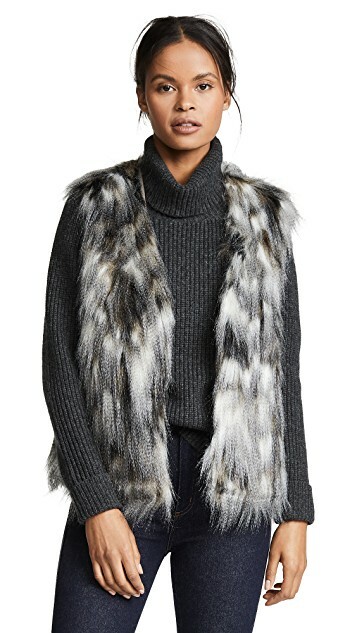 Not only will it add on the warmth but you will look perfectly stylish while getting together with friends, drinking hot cocoa at the lodge, or walking through Central Park with that special partner! Just because it’s Winter doesn’t mean women’s clothing has to be baggy, lackluster, or drab. Punch it up with some side details and you will be the appreciative focus of all you know and love, including yourself!